My Grandmother was never one to let a good product promotion pass her by. I think it was part of her fascination with her adopted country. Where else but in America could you save up a few box tops or clip a few coupons, mail them off and the sponsoring company would send you something free in the mail. Often these little give-aways would be handed down to one of her grandchildren. It was always fun to visit Grandma – you never knew what she had waiting for you. Usually it was just some small trinket from a cereal or soap company. Occasionally it was something really neat. One year she gave me and my brother miniature Civil War cannons she got from the Quaker Oats people – you know, the ones that shoot puffed rice out of a cannon. Those cannons ended up shooting thousands of pretend cannon balls in hundreds of pretend battles we held on our living room floor. Oh, the pretend carnage! Even after I was all grown up and in the Army I’d still occasionally get an odd item or two from her. Bless her heart, she never stopped thinking about us even long after we had left home and struck out on our own. In the late 70’s the Nestle company was running an advertising campaign highlighting the fact that their instant coffee, Nescafe, was the #1 selling coffee product world wide. It was no idle boast. Nescafe was (and still is) extremely popular in Europe, and Nescafe is commonly listed as a separate drink option on many restaurant menus. A lot of Europeans prefer it over brewed coffee. While I’m no fan of instant coffee I do have to admit that Nescafe is the least objectionable of the bunch. 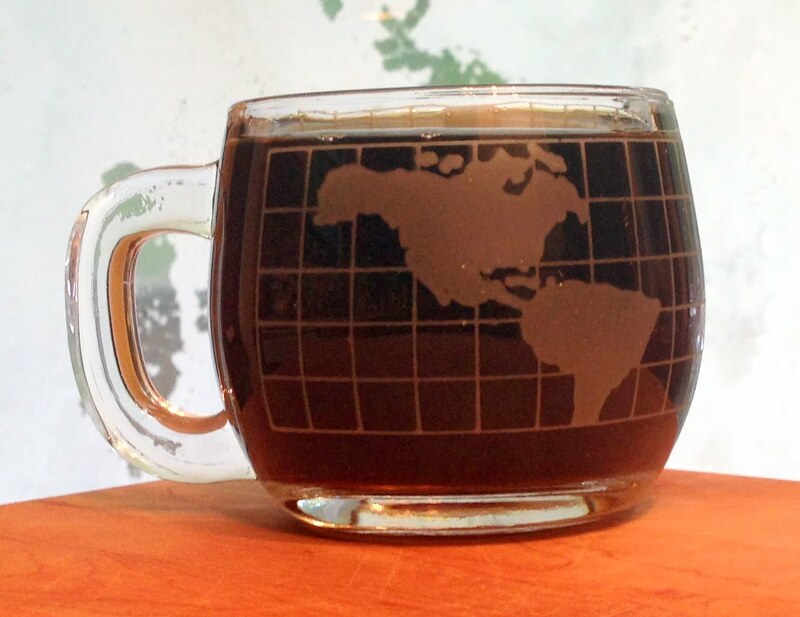 As part of the promotion Nestle produced a series of small glass coffee mugs emblazoned with a world map. Nothing fancy, just a highly simplified small scale map with a grid. My Grandmother got a set and passed them on to my parents. One day while home on leave my Mom passed along a couple of these mugs to me. At the time I was working as a topographer for the Army and maps were my business, so I thought it was a neat coincidence. I kept one of the cups on my desk at work and even occasionally drank coffee out of it. 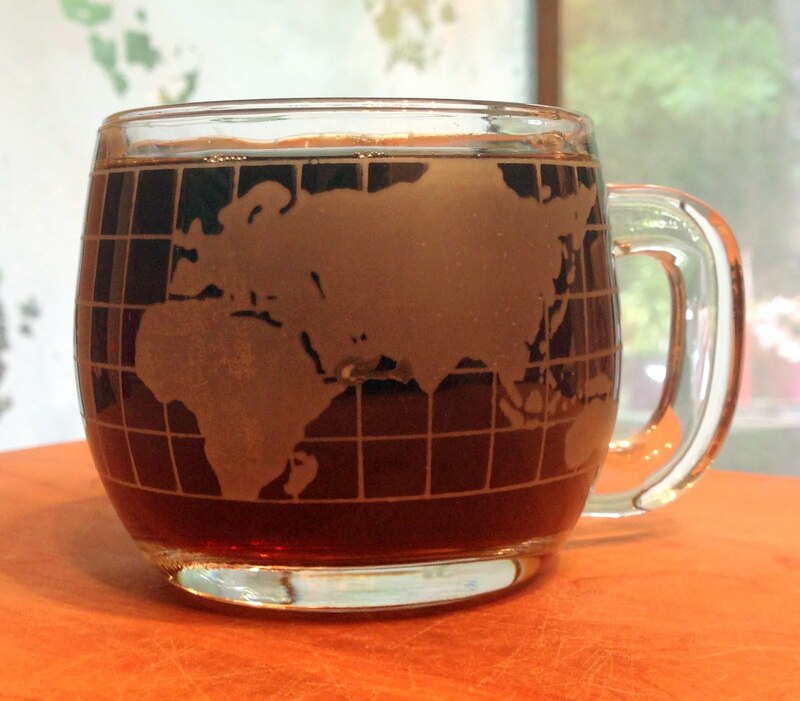 Over time the world map wore off and in a few years I was left with just a bare glass coffee mug so I pitched it. Some where along the way I lost its twin. It probably got chipped or broken during one of our many moves while I was in the Army. Being a lover of all things topographic, even kitschy little glass coffee mugs with world map appliques, I always kept my eye open for replacements. Last week I was cruising around eBay and decided to do a quick search for ‘nestle coffee cup’. I was surprised at the number of listings that came up for my long lost little mug. Apparently Nestle had millions of them made and most are still available through eBay sellers. I found a dealer who gave me a good price on a set of them and a few days later I was the proud owner of four gen-u-ine 1970s vintage cheap cast glass coffee mugs sporting world maps. Eastern Hemisphere. Hey, where’s the British Isles? Interestingly, they included Lake Baikal. but at least they included Puerto Rico. Being a topographic geek I note that the far north and far south polar regions are cut off and the grid appears to be square, so I’m guessing it’s a Universal Transverse Mercator projection. This entry was posted in General and tagged coffee by Brian Haren. Bookmark the permalink.